Jumping! Running! Smiling! Trampoline Park! Rock Climbing! Bull Riding! Want something super fun and energizing to do for the whole family? Here is a fun place to visit where your kids can go crazy and you can burn calories! A huge place with all types of trampolines, bull riding, rock climbing, ball pits, dodge ball! Having taken my daughters to so many birthday parties where the parents just sit and watch or drop off their kids, we wanted a fun active place for everyone, including the parents and siblings. Plus, it must be low stress for my husband and me and require “no setting up or clean up whatsoever on our part.” (to quote my hubby.) We thought about ice skating, amusement parks, a beach party, bounce house and then decided upon having her party at BIG AIR TRAMPOLINE PARK. Being the Fit Kid she is, we decided to have the party at a Trampoline Park called Big Air that was near our Southern California home. We split our time between Hawaii and So Cal. so this was perfect! It was filled with trampolines, rock climbing, bull riding, jousting and ball pits. Everyone jumped the entire time, even the parents! Bonus: we all burned major calories! The trampolines angled along the walls reminded me of Cirque du Soliel. 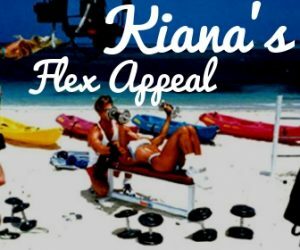 While filming Kiana’s Flex Appeal at Walt Disney World, Florida, I had several members of the Cirque Du Soliel cast workout with me and enjoyed going backstage to meet the cast. For the food, we served Hawaiian Pizza, her favorite. It has ham and pineapple on it with light cheese. She loves fresh fruit so we had watermelon, Maui Gold pineapple and grapes. The kids were too excited to eat, they didn’t eat very much. Kiana Jr. loves to cook with me at home and leads many Fit Kids Cooking Videos too! Browse recipes here. After a quick silly attempt at lunch, we had the birthday cake and all sang to my little princess. I love seeing her so happy. She was beaming. Thanks to Sky High Trampoline Park for hosting me during my daughters birthday party. As always, thoughts and opinions expressed here are entirely my own.